Mixed reports from the Tongariro. It wasÂ a funny old weekend on most rivers through the Taupo area with some anglers finding plenty of troutÂ and others totally being skunked due to lack of fish or lack of adventure. The weather was perfect over the long weekend with the best three days I have seen for months and thank god I was lucky enough to be out guiding and enjoying some sunshine with good clients. 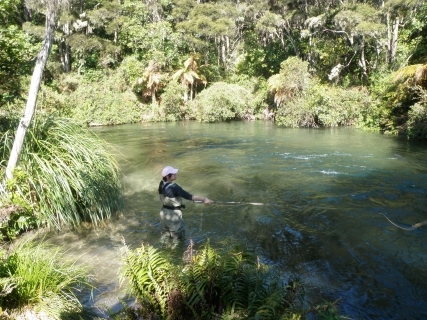 Angling pressure was minimal and most anglers walking about the Tongariro were finding fish and being able to find pools which had not really been fished. This does not happen often but with motel occupancy low and a negative outlook on the fishery anglers seem to be staying away giving the brave soldiers good fishing. Good or confident anglers will always catch fish in the Taupo fishery it really is only those who slip up twice a year and fish the places their grandad caughtÂ a fish 30 years ago that fail and go home spreading a negative outlook on things. If fishing was this easy we would not have any fish in our rivers and the thrill of stalking and finding trout as sport would not exist. On Saturday we enjoyed plenty of fresh fish through the braided area after that little bit of rain on Friday and spot x was on fire first thing in the morning giving my clients almost instant action using small glo bugs first thing in the morning. Everyone was hooking up and carrying trout with one angler almost continually enjoying a bent rod in the tail of the Honeypot. The Plank pool is holding fish especially in the edge of the head on the sand but these fish seem to have turned of the feed and developed lock jaw causing issues for anglers like myself. All fish hooked on this bright sunny day generally came from shallow fast water and care was needed while moving from area to area as to not spook potential captures. I fished withÂ Winomea on Sunday afternoon in the Waytoohardanuie for a few hours and was pleasantly surprised to see good numbers of fish in the upper river. As this was the Sunday of a long weekend I did not expect to much up here and did not expect to be the only car parked at the bottom of Blake Rd. As there has beenÂ a few break ins of vehicles up here of late I was reluctant to leave the vehicle and wondered why I was theÂ only car up here, all was fine when we got back though. 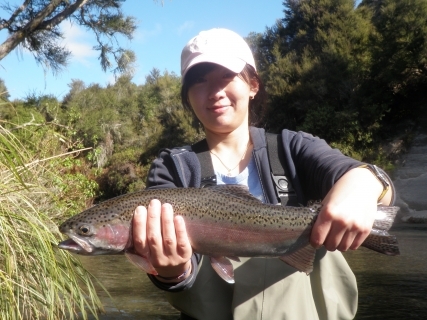 Winomea had not fished before and did well to hook and land her first ever trout in the first pool which was the Pig pool. The river is carrying more water at the moment and this pool is looking fantastic for nympher’s and wetliners and would be one of my more productive pieces of water. We fished the Reed pool next and was again hooked up before long to a small but fiesty fresh fish which again gobbled the size 12 glo bug after many attempts with naturals, you just never know when you will need a glo bug. We fished all the way to the Gordon Williams and did not pass another angler which was unreal as this area of the nuie is just about always had good pressure on weekends. We spotted quite alot of fish throughout the river with the larger fishÂ recovering and the fresher fish beingÂ somewhere in the 2lb bracket. 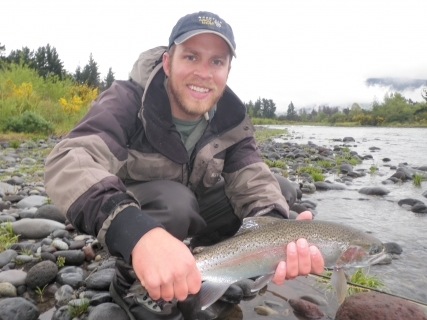 In the last few days I have been disappointed with the Tongariro which is weird as after the weekend you would expect to have plenty of fish willing to feed with even less anglers about. Mike has once again given the river a flogging with a couple of good 12 hour sessions but has only managed 10 fish per day. You may think this is good numbers and for most anglers it would be a personal best but anglers with Mike’s skills and knowledge of this river it is a lean day for 12 hours. It is not hard to rack up 10 fish in this river with a little bit of luck as sometimes when trout are lined up in your favourite lie it is easy to pull 5 out in ten minutes or in as many casts. Everyone has struggled the last few days including me when I was guiding Ian Mcbride from Idaho when we ended the day with a total of three fish. Fish caught are generally in goodÂ condition but they are few and far between for most anglers. Poor Ian had to deal with terrible weather with all seasons in the day including a stiff southerly wind which made flicking heavy nymphs dangerous and uncomfortable. I really feel sorry for these guys as alot of my clients are used to fishing small dry patterns in tiny stream in America and have never seen or heard of our style of nymphing. I try and lighten these rigs up as much as possible but if you are not getting down amongst the fish you are wasting your clients time, I only ever want the client to have a great day out and succeed at catching a fish. I hope the weather improves in the next few days and we can get out and explore a little more around the Taupo rivers and see where these trout are hiding. Backcountry is very much on the cards at this time of year but even that is being made hard with high water levels with snow melt and obviously rain. I have been out and about in the headwaters of different systems and have had a ball with heaps of good condition fish falling victim to small naturals. I am one of the young strong ones which can handle deep strong crossings and am not quite effected as much as an older angler with the higher water conditions. I had an interesting conversation the other day with another angler concerning what pound flurocarbon should be used while nymphing clear water. His arguement was that 8lb was too heavy and you should be using 6lb as trout will have less of chance of seeing it and will increase your catch rate. Well maybe? but…. if the flurocarbon is invisible should it matter if itÂ is 6lb or 26lb? The only thing that screams out to me that will be different will be the movement that the 6lb will give to the fly as apposed to the heavier pound line. I don’t know about all this but I do know my old man has as many fish out as anyone else and he still uses maxima nylon!.